Orthoptera ("straight wings") is a widespread order of generally large- or medium-sized insects with incomplete metamorphosis (hemimetabolism), chewing/biting mouthparts, and two pairs of wings, held overlapping the abdomen at rest. The forewings are narrower than the hind wings and hardened at the base, and the hind wings are membranous and held folded fan-like under the forewings when at rest. This order includes grasshoppers, crickets, katydids, and locusts. Orthopterans are associated in many people's minds with the sounds they make. There are few places in the world where one cannot experience the "singing" of grasshoppers, katydids, and crickets during the warm seasons, with grasshoppers characteristically calling during the day, and katydids and crickets at night (Gwynne et al. 1996). While these qualities are used for the insects' individual purpose of survival, maintenance, and reproduction (being used to find mates, warn of predators, and defend territory), they also enhance human enjoyment of nature. Orthopterans also are important to ecosystem food chains, converting plant biomass into a form usable by birds, mammals, and other animals. Grasshoppers, katydids, and crickets also are known for their jumping ability. Orthopterans are commonly divided into two suborders: Caelifera (short-horned grasshoppers, including true grasshoppers and locusts) and Ensifera (long-horned grasshoppers, including crickets and katydids). Traditionally, the order had also included cockroaches, praying mantids, and walking sticks. Among other distinctions, the two suborders are generally recognized by the size of their antennae, with Ensifera having longer antennae. Orthopterans are found in virtually all terrestrial habitats were plants can live and where one can find insects, being absent only in oceans, polar regions, and extreme alpine environments (Grizmek et al. 2004, Rowell and Flook 2001). They generally are large to medium in size as far as insects go, with body lengths of less than 10 millimeters (0.4 inches) uncommon, and some exceeding 100 millimeters (2 inches) in length with a wingspan of 200 millimeters or more. The smallest are below 2 millimeters. All members of the suborder Caelifera are plant eaters, as are most members of Ensifera, but there are some carnivorous members of the long-horned grasshoppers. Orthopterans have mandibulate mouthparts, large compound eyes, and antennae length that varies with species. One of the characteristics most associated with orthopterans is the production of sound. Many, but not all, insects in this order produce sound, which is used for attraction of mates, defense of territory, and to warn of predators (Grizmek et al. 2004). The technique usually used is stridulation, involving rubbing one body part (wing, leg, abdomen) against another part. Katydids and crickets (Caelifera) rub specialized parts of wings against structures on other wings, while grasshoppers (Ensifera) produce sound by rubbing part of the hind femur against part of the wing (Grizmek et al. 2004). This singing is typically a male phenomenon, as females are typically silent. The calls are generally species specific and the information can be a code in terms of the frequency modulation (pitch changes) or time modulation (pitch changes, but temporal pattern changes) (Grizmek et al. 2004). Most orthopterans are solitary insects, but gregarious tendencies are common among many crickets, and swarming behavior is seen in locusts. Locusts are migratory short-horned grasshoppers of the family Acrididae. In response to certain cues, they shift in behavior from a solitary phase to a migratory phase. For example, the desert locust (Schistocerca gregaria) of Africa and Asia is normally solitary, but the spring rains trigger a behavior transformation that can result in single swarms larger than any other single congregation of organisms on Earth, ranging from 100,000 to 10 billion insects (Grzimek et al. 2004). One swarm in 1794 once spread over 5,000 square kilometers (almost 2,000 square miles) (Grzimek et al. 2004). Some members of the suborder Ensifera also produce huge swarms, such as the wingless katydid known as the North American Mormon cricket (Anabrus simplex), whose swams can be devastating to crops, and the Conehead kaytdids (Ruspolia spp.) of Africa (Grzimek et al. 2004). Grasshoppers develop by incomplete metamorphosis, a process in which the larvae resembles the adults somewhat, as they have compound eyes, developed legs, and wing stubs visible on the outside, but the juvenile forms are smaller, lack fully developed reproductive organs, and, if the adult has wings, lack wings. In this mode of development, which involves gradual change, there are three distinct stages: The egg, nymph, and the adult stage, or imago. There is no pupal stage characteristic of complete metamorphosis. Through successive molts, the nymphs develop wing buds until their final molt into a mature adult with fully developed wings. The number of molts varies between species; growth is also highly variable and may take a few weeks to some months depending on food availability and weather conditions. The oldest opthopteran fossils trace to the Carboniferous period; most families of Ensifera appeared between the early Jurassic and early Triassic periods, while the oldest extant family of Caelifera appeared in middle Jurassic (Grizmek et al. 2004). The suborder Caelifera (short-horned grasshoppers) consists of grasshoppers and locusts. All have jumping back legs, antenna composed of less than 30 segments, absence of auditory organs on the prothorax (hearing organs, if present, are abdominal), and an ovipositor in which there are four functional valves. The largest superfamily is Acridoidea with over 7,200 described species in 1,600 genera (Grzimek et al. 2004). The largest family is Acrididae, the "true grasshoppers." The family is characterized by the short, thickened antennae and relatively unmodified anatomy. They are often visually more striking than other Caelifera, due to the adults' wings and legs, which are well developed and may be brightly colored. The Acrididae includes the locusts, which can be serious agricultural pests. The term grasshopper is an imprecisely defined common name. It generally is used in reference to members of both the orthopteran family Acrididae of the suborder Caelifera and to members of the family Tettigoniidae of the suborder Ensifera. It may also be used to refer only to the Acrididae or to the entire suborder Caelifera. 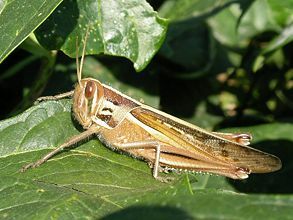 Locusts are grasshoppers that are characterized by behavior. They are defined as several species of short-horned grasshoppers of the family Acrididae that have solitary and gregarious (swarm) phases. They do not belong to a particular genus or subfamily, but are those species of grasshoppers that exhibit behavioral, morphological, and physiological changes from a solitary phase to a migratory phase (Grzimek et al. 2004). Diurnal activity is common in Caelifera, with grasshoppers and locusts feeding and mating during the day, and molting and laying eggs at night, while the reverse is true for the Ensifera (katydids and crickets), who generally exhibit nocturnal activity (Grzimek et al. 2004). Grasshoppers sing typically during warm season days and katydids and crickets sing during warm season nights. The suborder Ensifera (long-horned grasshoppers) consists of crickets and katydids. Members are characterized by fine and threadlike antennae with well over 30 segments (except fossil representatives), stidulatory specializations of the forewings to make sounds in those groups that sing, auditory organs (when present) linked via modified tracheae to the enlarged mesothoracic spiracles, and a six-valved ovipositor (Gwynne and Desutter 1996). The suborder is divided into six superfamilies, 21 families, 1,900 genera, and 11,000 described species (Grzimek et al. 2004). The largest superfamily is Tettigonioidea (katydids or bush-crickets) with over 1,000 genera and 7,000 known species (Grzimek et al. 2004). The superfamily Grylloidea (crickets) includes over 500 genera and 3,500 described species. Members of the family Tettigoniidae are commonly known as bush crickets or katydids, and are closely related to the crickets. Orthoptera also are the only insects considered kosher in Judaism. As stated in Leviticus in the Bible: "All winged swarming things that walk on fours shall be an abomination for you. But these you may eat among all the winged swarming things that walk on fours—locusts of every variety; all varieties of bald locust; crickets of every variety; and all varieties of grasshopper.” However, different opinions exist on which exact species are considered kosher. The Jewish Torah states that the flying insects with four walking legs that are kosher are those whose knees extend above their feet to hop on the ground (Grzimek et al. 2004). Although generally Orthoptera is divided into two suborders, Ensifera and Caelifera, there are classification schemes that consider only the short-horned orthopterans to be included in the order, and another order, Grylloptera, comprises the long-horned grasshoppers, such as crickets and katydids. Gwynne, D. T., L. DeSutter, P. Flook, and H. Rowell. 1996. Orthoptera. Crickets, kaytdids, grasshoppers, etc.. Tree of Life Web Project. Retrieved April 8, 2007. Gwynne, D. T. and L. DeSutter. 1996. Ensifera. Crickets, kaydids, and weta.. Tree of Life Web Project. Retrieved April 8, 2007. O'Toole, C. 2002. Firefly Encyclopedia of Insects and Spiders. Buffalo, NY: Firefly Books. ISBN 1552976122. Rowell, H. and P. Flook. 2001. Caelifera. Shorthorned grasshoppers, locusts and relatives. Tree of Life Web Project. Retrieved April 8, 2007. This page was last modified on 10 November 2008, at 16:14.